Signals of Spring is happy to announce that for the first time, students can follow the tracks of the Gray Wolf, compliments of our Collaborating Partner, the Fish & Wildlife Division of Alberta Sustainable Resource Development. Gray Wolves were eradicated by the mid 20th century in southwest Alberta, but in recent years, the wolves have reestablished their populations in this area. Since their numbers have increased, there has been some concern about these animals living in areas populated by humans. Cattle ranchers are particularly concerned because wolves are known to occasionally prey on livestock. Resident wolf packs established in the area in the 1980's and 90's, but without an ability to track the animals, it was difficult to understand their populations and behaviors. 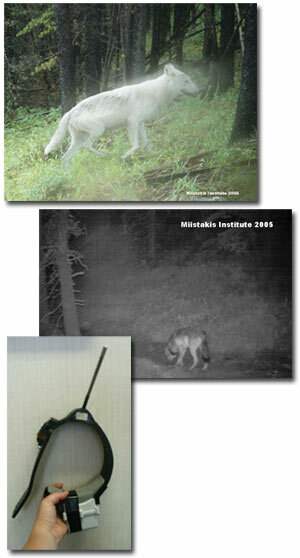 So, Signals of Spring partner Dr. Carita Bergman and her team of local stakeholders have attached radio and satellite collars to wolves in order to monitor their movements. Dr. Bergman expects the animals to stay within their home range, which is an area that ranges in size from 300 to 1200 square kilometers annually. She explains, "The collars help us to understand the wolves' territories, pack dynamics, and movement between packs." It is important to know whether wolves are mating with wolves from other packs so they do not become genetically isolated. One exciting thing to note is that the wolves might be expecting pups within the next month or two! Wolves may have anywhere from 1-8 pups at a time, normally having about 4 in a litter. The animals usually live in a family group consisting of the breeding pair (parents), the new pups and older pups. The older pups help out by bringing food back to the den. The mother stays with the new pups in the den for about a month. Then, she will introduce the babies to the rest of the pack, and they will begin to use 'rendezvous sites' later in the summer. By August or so, new pups are ready to learn to hunt. Their normal food sources include deer, elk, moose and some smaller mammals such as rabbits. As these prey of wolves are plant eaters, Dr. Bergman advises Signals of Spring students to carefully consider vegetation and geography, and how they might connect to wolf movements. Also, students might look for clusters of locations that could indicate wolves are feeding on a large kill such as a moose or an elk. Signals of Spring students consider what other factors might explain location clusters within a wolf territory. Keep an eye on the wolves this spring; they are sure to be interesting!